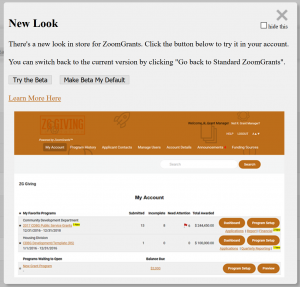 ZoomGrants is excited to announce a new look for our administrative users! The ZG Development Team has taken your feedback and has been hard at work to update our user interface. After logging into your administrative account for the first time following the update on April 6, 2018, you will have the ability to switch over to the new ZoomGrants look via two different options that will appear in a ‘pop-up’ window. Trying the new look, or making the new look your default will not affect how your other users (other admins, reviewers, contributors, applicants) will see your program(s) or your account. 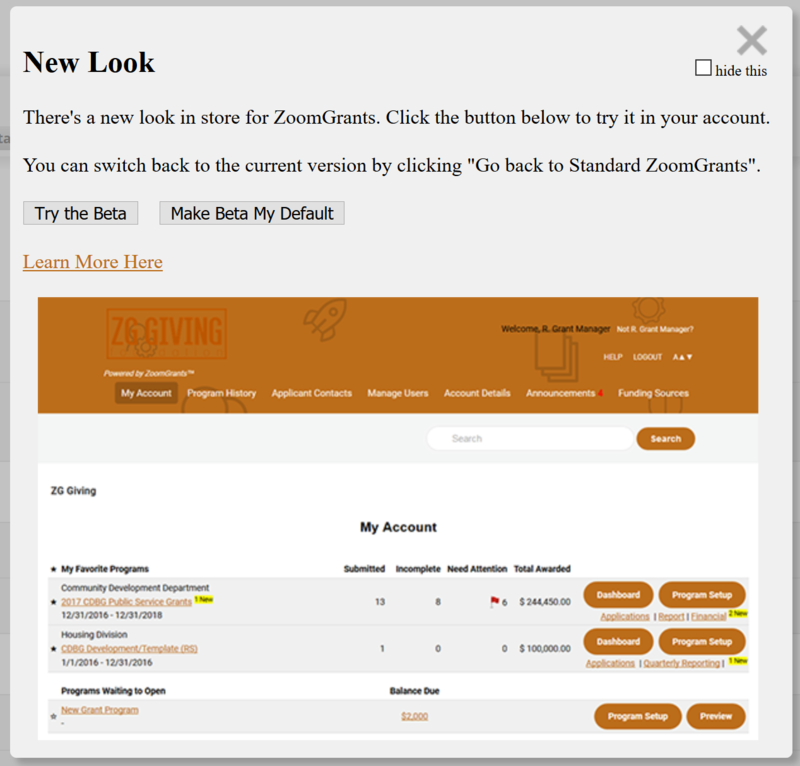 By selecting this option, you will be able to try the new ZoomGrants look for the current user ‘session’. After logging out and back into your account, the pop-up window will continue to give you the option to try the new look (Try Beta) or make the new look the default for your account (Make Beta My Default. )You can always hide the popup from showing up in the future by checking “Hide This” and clicking the X in the upper right corner. Once you are ready to make the change over to the new look, choose ‘Make Beta My Default’! Once this option is chosen, the pop-up window will no longer appear, as the new look will be saved as the default upon logging in! Go Back to Standard ZoomGrantsNot quite ready for change? No problem! If you wish to switch back to our standard look, after giving our new look a try, you will be able to do so via the ‘Go Back to Standard ZoomGrants’ link in the top right-hand corner of your account. See Without Custom ColorsIf you have setup custom colors, the custom colors associated with your account may be preventing our new look from being optimized. If things are not looking right, click the ‘See Without Custom Colors’ link in the top right-hand corner of your account. It is important to note that you can customize your new look and feel pages without affecting the “standard” ZoomGrants customization’s. In other words, if your custom colors from the past don’t look good in the new world, you can customize the new world without affecting the “standard” look and feel.